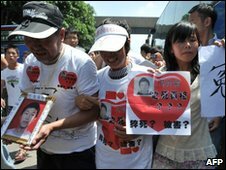 Chinese papers are unhappy about a series of suicides at the Foxconn electronics factory in mainland China's Shenzhen. Some of them suggest the deaths happened because this new generation of workers are not able to cope with factory working practices. Others believe that Foxconn's parent company - Taiwan's Hon Hai Precision Industry - and its chairman Terry Gou must be responsible for improving conditions. And one Hong Kong paper questions the role of the local police in the affair, suggesting that they have been too quick to label the deaths as suicide. The case of "11 consecutive suicides" at Foxconn has highlighted the incompatibility between the existing pattern of economic growth and a new generation of workers as well as some problems in China's economic and social transformation that urgently need to be addressed. When more and more post-80s, post-90s and even post-00s are entering the work force, it is unsustainable to keep relying on this low-end means of production that is built on cheap labour. The 11 Foxconn employees... used this extreme choice of jumping from buildings to tell us that they do not accept China's manufacturing industry's continued advance in this direction... Enterprises must treat and respect staff as real living human beings and not as a part of the production line. Workers on the mainland should be treated properly by the companies that make the products we buy. That means paying them a fair wage for reasonable time worked. Some enlightened companies already do so, but others will need to be prodded - either by the authorities or workers' organisations. We should realise that social injustice may have reached a critical point before such large-scale incidents were triggered. The Foxconn suicides and stabbings of schoolchildren are signals indicating this deeper malaise. Though such incidents may not all be directly linked to specific cases of social injustice, it has to be admitted that the unfavourable social environment has caused some people to lose hope. Foxconn may not be a sweatshop in the sense that it physically abuses its employees or forces them to work extra hours. But that does not mean it is showing enough humanitarian concern for its employees... The real working conditions of its employees must be laid bare for all to see - only then will the public be able to analyse for themselves the rights and wrongs behind such a string of suicides in the workplace. The tragedy of Foxconn is a microcosm of the tragedy of China's economic model of relying on a cheap labour force. But as the owner of one of the world's richest businesses, Hon Hai has a responsibility to improve conditions. The most fundamental is to treat staff as "human" rather than emotionless cogs on the production line. Foxconn is not a sweatshop by general definition, but some inhumane management measures may be linked to the tragedies... We hope that Terry Gou has a good policy solution to establish a new system and working culture to allow hundreds of thousands of Foxconn employees to work and live with satisfied material needs and spiritual happiness and thus establish a model for the running of mainland factories. Terry Gou's apology and withdrawal of the non-suicide agreement is only a start for Foxconn to move towards normalisation! It is hoped that Foxconn can face up to the dismal life of its employees and address the core problems in its management! Although each case of death is questionable, the Shenzhen authorities have completely turned a blind eye... The police... stand accused of favouring the company and of a serious dereliction of duty... The authorities should find out the cause of death and publish the results. Even if they were all suicides the city government should also investigate the social factors behind this before it is too late.